What makes one unclean? What defiles a person? To use the germane Greek idiom, what makes a person common? Priestly baring of his head or rending of vestments. The Law of Moses does not like female biology, does it? 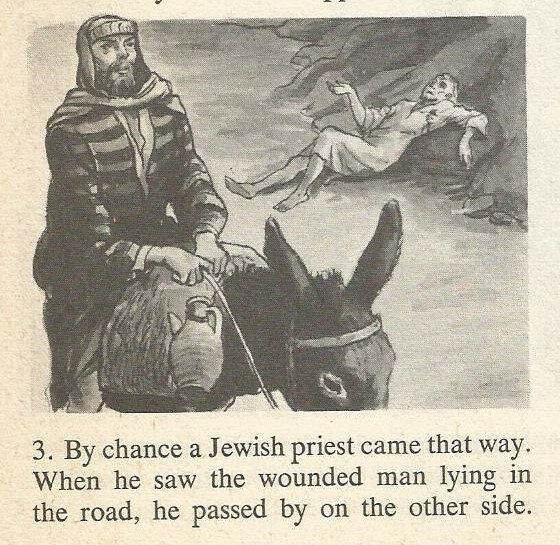 The Parable of the Good Samaritan (Luke 10:25-37) includes a priest who refused to violate the third item on that list, for fear that the man lying by the side of the road might be dead. That priest would have become ritually unclean, therefore not fit to perform sacred rituals for a few days, according to Leviticus 21. The priest was not the hero of our Lord and Savior’s story. But the things that come out of a man’s mouth come from his heart and mind, and it is they that really make a man unclean. For it is from a man’s mind that evil thoughts arise–murder, adultery, lust, theft, perjury, and slander. There is nothing outside a man which can enter him and make him “common.” It is the things which come out of a man that make him “common”! The list from Matthew 15 describes how to harm others and oneself in the process. Building up others (and therefore oneself in the process), as in the readings from 2 Corinthians, does the opposite of defiling one, therefore. The priest in the Parable of the Good Samaritan should have thought of that. Holy God, through your Son you have called us to live faithfully and act courageously. they form a good code of justice. We are always in the presence of God. Nevertheless, sometimes the presence of God becomes evident in an unusually spectacular way. How one ought to respond to those occasions is one topic in the assigned readings for these three days. 1 Peter 2 and Exodus 19 bring up the point of the faithful people of God having the responsibility to be a light to the nations. First, however, the faithful people must become that light. This was originally the call of the Jews, who retain that call as well as their status as the Chosen People. Far be it from me to give short shrift to the Jews, my elder siblings in faith! I, a Gentile, belong to the branch which God grafted onto their tree. The holy God of the covenant demands as preparation a separation from those things which are normally permitted and good in themselves. 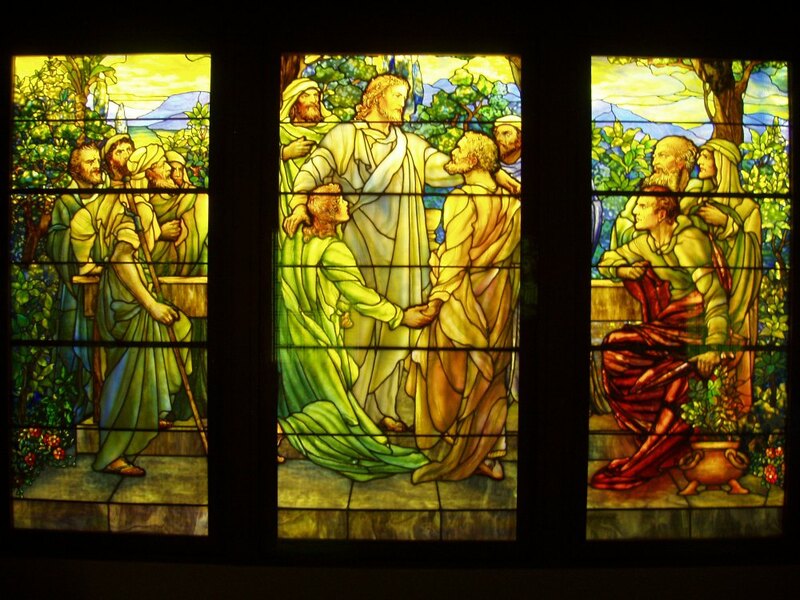 The giving of the covenant is different from an ordinary event of everyday life. Israel is, therefore, to be prepared by a special act of preparation. As for women and the Law of Moses, I cannot help but notice that the code reflects a negative view of gynaecology. May such sexism become increasingly rare in today’s world. One pious yet misguided response to a spectacular manifestation of the presence of God is to seek to institutionalize it. That was just one error St. Simon Peter committed at the Transfiguration, the description of which I understand as being more poetic than literally accurate. (Could any description do the event justice?) Another error was that the three proposed booths would be the same size; one should have been larger than the others. Although we dwell in the presence of God and might even be aware of that reality most of the time, we still need moments when we experience it in unusual and spectacular ways. Mundane blessings are wonderful and numerous, but sometimes we need another variety of blessing and a reminder of the presence of God. I have had some of them, although they were substantially toned down compared to the Transfiguration, the burning bush, and the giving of the Law of Moses. They were, however, out of the ordinary for me. Thus I remember them more vividly than I do the myriads of mundane blessings and encounters with God. These unusual epiphanies have edified me spiritually at the right times. They have also called me to continue on my spiritual walk with God through easy and difficult times. 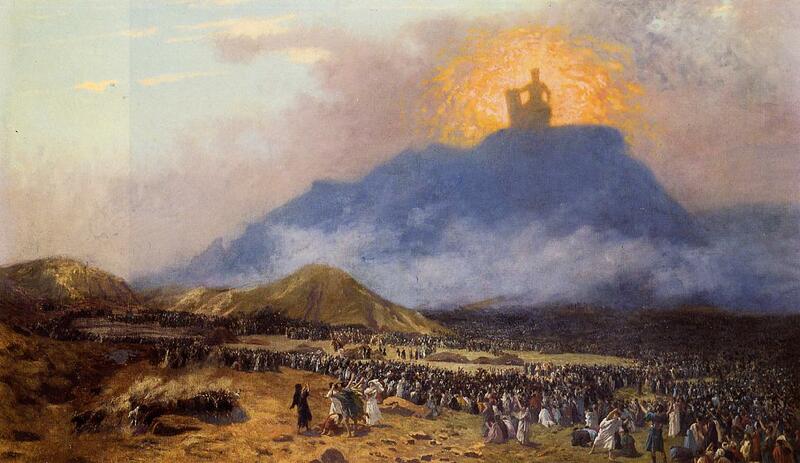 That journey is one for the glory of God and the benefit of others–perhaps including you, O reader. Therefore, since we are surrounded by so great a cloud of witnesses, let us also lay aside every weight, and sin which clings so closely, and let us run with perseverance the race that is set before us, looking to Jesus the pioneer and perfecter of our faith, who for the joy that was set before him endured the cross, despising the shame, and is seated at the right hand of the throne of God. Consider him who endured from sinners such hostility against himself, so that you may not grow weary or fainthearted. In your struggle against sin you have not resisted to the point of shedding your blood. My little daughter is at the point of death. Come and lay your hands on her, so that she may be made well, and live. And he went with him. If I touch even his garments, I shall be made well. Daughter, your faith has made you well; go in peace, and be healed of your disease. Your daughter is dead. Why trouble the Teacher any further? Why do you make a tumult and weep? The child is not dead but sleeping. Little girl, I say to you, arise. And immediately the girl got up and walked; for she was twelve years old. And immediately they were overcome with amazement. And he strictly charged them that no one should know this, and told them to give her something to eat. If a woman has a discharge of blood for many days, not at the time of her impurity, or if she has a discharge beyond the time of her impurity, all the days of the discharge she shall continue in uncleanness; as in the days of her impurity, she shall be unclean. Every bed on which she lies; all the days of her discharge, shall be to her the bed of impurity; and everything on which she sits shall be unclean, as in the uncleanness of her impurity. And whoever touches these things shall be unclean, and shall wash his clothes, and bathe himself in water, and be unclean until the evening…. This was the woman’s condition in the reading from Mark. Her physical problem, which the doctors she visited could not remedy, made her a social outcast and rendered her destitute. This was cruelest element of her condition, and it had more to do with how others understood her (and therefore treated her) than with her medical state. The power of culture is pervasive, but only as widespread as we permit it to be. We could choose to be merely kind human beings, if we wanted to do so. But no, often we go with the flow, join in group behavior, and find ways to justify cruelty to our fellow human beings. We might not even recognize the cruelty of which we are guilty. But Jesus was kind. He healed her physically, emotionally, and psychologically. And he restored her to society. We are social creatures, so the opinions of our peers matter to us and affect us. May we emulate Jesus, not this woman’s peers. This is true, is it not? Wrapped around the tale of the woman with a menstrual hemorrhage is the story of a desperate father. His twelve-year-old daughter was severely ill. 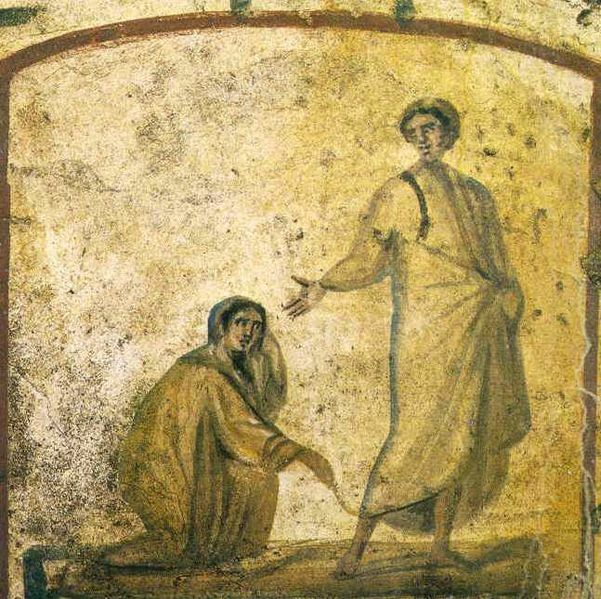 But Jesus, Jairus was convinced, could heal her. Before the two men could arrive, however, the daughter died. “Why trouble the teacher any further?” some wondered after this development. But the woman with the hemorrhage did not trouble Jesus, and neither did the situation with the daughter of Jairus. I detect a third theme, one focused on blood. In the Law of Moses the feminine discharge of blood renders one (and objects with which one comes into contact) unclean and impure. Yet, as the author of the Letter to the Hebrews alludes, the death and resurrection of Jesus changes everything. The execution of Jesus was supposed to bring about shame (shame being a societal concept, not anything inherent to an individual) upon Jesus, but the crucifixion of Jesus became his exaltation in the Gospel of John. In Christian sacramental theology blood has become something desirable, under the transubstantiated cover of wine. Where then, is the shame associated with blood? So I encourage you, O reader, to rejoice in the examples of Jesus and of the saints of who gone on before you. We stand in the midst of a great cloud of witnesses, including that woman Jesus healed, Jairus, and (hopefully) his daughter. They are neither foolish nor impure, and they are not really dead. They are our family members in faith. May we join their company one day.